Mesh Dress Coat / 5 Sizes with fur collar, fur sleeves and non rigged belt. Orphée now updated for mesh body ! The top with gloves is open in front, suggesting the lines of your body. The pants are open on front of your leg. The long skirt follow your movements slowly. – The sleeves and a feather fan in the back are adorned with long feathers and surrounds you with a downy softness. – The fascinator is made of roses, pearls and feathers with a net veil covering your face. 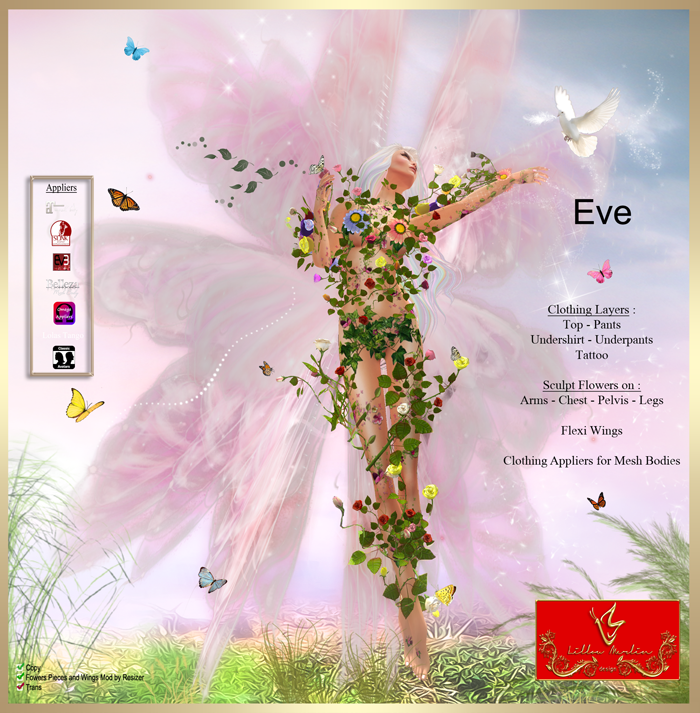 Multi Clothing Appliers for “Slink, EVE, Maitreya, Belleza, Omega and Lolas Tango”. This beautiful dress is also available in black. Fitted Mesh Dress ONLY for EVE Fitted Mesh Avatar. – Mesh Dress Eve Slim. Mesh Dress Fitted for “EVE” Avatar Pulpy & Slim ONLY ! HUD texture changer (2 Patterns).